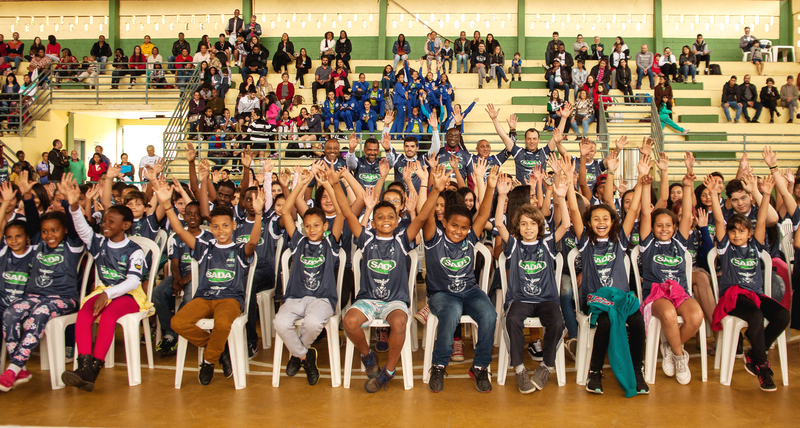 The results go beyond the titles and trophies and all the achievements of the professional team serve as a great stimulus for 2,000 students who learn to play volleyball at schools and sports projects connected to Sada Cruzeiro in Minas Gerais. Youngsters who stand out in these programs may have the chance to join the base categories of the club (which is one of the leading trainers of athletes in Brazil). And the girls who show talent are directed to a more advanced project, with competitive base teams, and are also referred to professional clubs. Since 2010, the team has partnered with Sesi-MG for the development of the “Projeto Sada Vôlei Sesi”, which offers free volleyball classes for children and young people of both sexes in the Sesi Betim unit and in the Contagem gym. Call +55 31 3592-1181 for more information on the project in Betim and + 55 31 3352-5377 for Contagem. A similar project is held in the city of Ouro Preto, with free classes to 200 students of both sexes. For more information on the Ouro Preto project, call +55 31 3559-3216. In Belo Horizonte, children and young people who want to take volleyball classes can enroll in the Cruzeiro sports school, which receives a large number of students (men and women of all ages) inspired by the results of the volleyball team every year. Those who stand out can also have an opportunity in the junior teams of Sada Cruzeiro. For more information on the Sports School, call + 55 31 3291-2647.